… as well as exciting articles about cycling history. 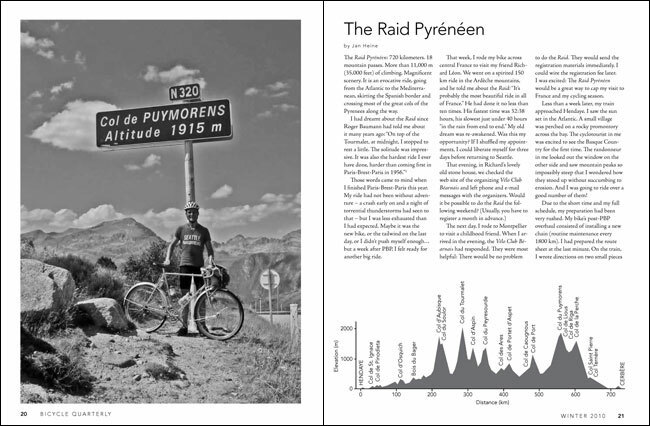 More than a dozen favorite articles are available in pdf format on the web site, including Jada Van Vliet’s classic about “Touring in India” on a locally-made 3-speed, a report from the “Raid Pyrénéen” and our test of the Calfee “Adventure” carbon-fiber bike for wide tires. To make all this content more easily accessible, we made the navigation as simple as possible. There is even a shortcut for subscribing or renewing with just a few clicks of your mouse. Start exploring the new site by clicking here. The revamped site looks and works really great. Congratulations on the new site and your acquisition of Rene Herse! Where are you riding in the image next to ‘Rides’? That photo works, because it makes me want to drop everything and go there. That photo shows Mount St. Helens. From Windy Ridge, there is a dirt road that leads to the bottom of the immediate blast zone. It’s a spectacular ride. Nice and clean and simple. Looks good! Looks cool, but I can’t figure out how to navigate the site on an iPad. I can only select the top item of each of the drop down menu. Is there another way to access those pages that I’m missing? Try again! We fixed a minor glitch, and it should be working now.